Experience the game of paintball in the snow! Track your opponent and take cover behind snowy bunkers. Visit the website for winter specials and events! Winter in the Pocono Mountains will never leave you bored. Visit Skirmish Paintball, the world's premier paintball facility, and experience a game that will have your adrenaline at an all time high! Storm the castle, hide behind a snowy tree, and defend your paintball army. 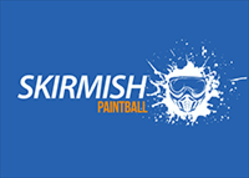 Skirmish has everything you need for a great day of paintball. Your entry includes your paintball gun, goggles/facemask, unlimited N2 air fills, professional referees, and all day play. Visit the website to explore special events and discounts, or call 1-800-SKIRMISH (754-7647) for trip planning assistance. Experience the World's Premier Paintball Facility!